Syiok Sendiri! A Very Merry Malaysian Christmas!' is the first installment of the 'Syiok Sendiri' series, a comedy-variety project we are hoping would be an endless saga of celebrating the spirit of 'self amusement' on stage. Expect drivel material, not-so-high-brow stuff, and occasional 'siapa makan cili terasa pedas' (tak faham, google la ye!) moments. But ingat ye, no need to be tersinggung and all ok. It's all in good fun. So datanglah beramai-ramai to penangpac from 5-7 December and join the Syiok Sendiri crew as we celebrate Christmas...a la Malaysia. * For Mature Audience ONLY ! I caught Syiok Sendiri! : A very merry Malaysian Christmas! today. On kind of a whim. Well, not really a whim. I knew a couple of people who were involved in it and since I was feeling bored and unmotivated to do anything today, and there were tickets, mah go lor. 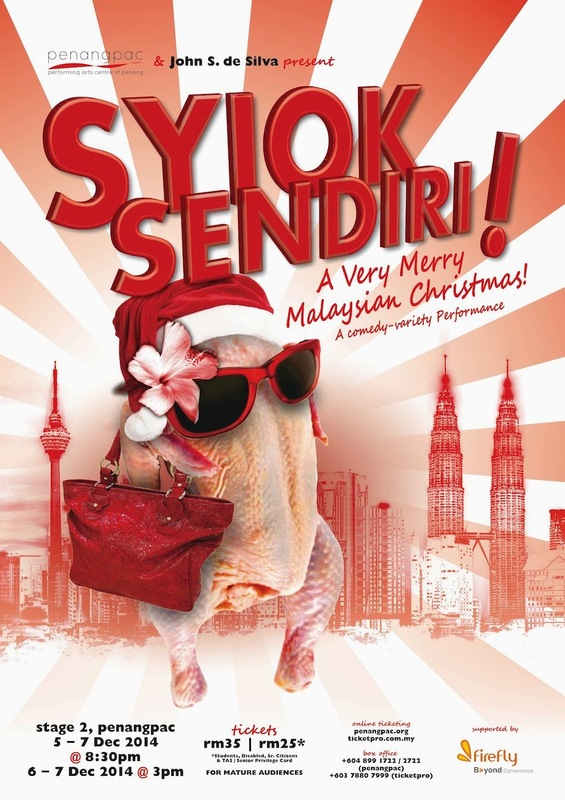 Syiok Sendiri is a "comedy-variety performance", which was truly funny (only if you understand the Malaysian context) and very varied. There was a Christmas performance, a drag queen, some keyboard warriors, annoyed flight attendants, a gossipy sales girl, a very cinapek Scrooge, catwalks, a game show, bollywood, errr too many things to remember right now. I have to say that it was really rather well done... and rather deliciously seditious. Don't go if you're easily offended or if you don't quite understand what satire is. Two more shows tomorrow (Sunday)! Tickets are RM35 each. Performance wise, I would say that the cast did a great job overall. I especially loved Kanchana and Isabelle - I would say that they were the most natural and realistic of the six. One major weak point I would have to point out would be that since that Stage 2 is really a very small stage, and I sat right in front because, well, because, there could have been more emphasis placed on facial expressions. This wouldn't really be relevant if this had been done on a bigger stage, say Stage 1, where the audience are really quite far away from the performers - I think the body language was pretty much consistent - but being that close up, there were several instances where it felt like the actors broke character a little based on their facial expressions. Or maybe I'm just expecting too much facial expressions. I don't know.